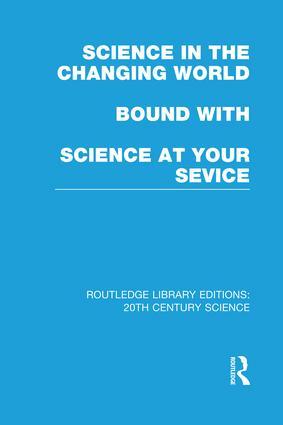 Science in the Changing World, first published in 1933, contains a series of broadcasted presentations on the relationship between science and the development of European civilisation in the first half of the 20th century. Specifically, each talk attempts to reflect the crisis through which the world seemed to be passing at the time, and to make an analysis of those forces of transformation in science, art, economics, and social life which were associated most closely with the advent of the ‘scientific’ century. Included among the presenters are such eminent and diverse thinkers as Julian Huxley, Bertrand Russell and Hilaire Belloc. Science at Your Service: First published in 1945, this collection of twelve BBC broadcasts focuses on the influence of science in everyday life, and demonstrates that not all science is remote and theoretical. Each speaker deals with some aspect of mid-20th century scientific advance as it related to subjects of practical importance, from textiles and tunnels to fishing and ship design. Offering a glimpse into the attitudes towards science current in the middle of the Second World War, this brief and accessible collection will be of interest to cultural historians as well as to the general science enthusiast. Part I What Is Science? Part II What Is Man? Part III What Is Civilization?